New research reveals that Brits have lost touch with the centuries-old tradition of making and enjoying the classic Christmas pudding. Three quarters (75 per cent) of Brits admit they have never made their own Christmas Pudding, half (49 per cent) don’t even eat the festive dessert on Christmas Day and more than three quarters (78 per cent) don’t know what ‘Stir Up Sunday’ is (the last Sunday before Advent when traditionally the whole family gathers in the kitchen to stir the Christmas pudding mixture and make a wish). 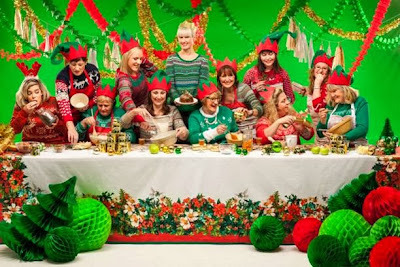 To reignite budding bakers’ passion for this dying tradition, the nation’s favourite golden syrup, Lyle’s® has launched a countrywide campaign – Bake, Eat and Be Mary - and has recruited an army of Mary Christmases from the length and breadth of the British Isles to share their traditional Christmas pudding recipes. The campaign launched all ready for Stir Up Sunday (today) with recipes from 100 Mary's from John O’Groats to Land’s End, each an expert in the art of making Christmas pudding and with a trusted family recipe to ignite a whole new generation’s interest in this centuries-old national tradition. The ‘Mary Christmas’ army will be tasked with passing on their pudding prowess to Brits who have fallen out of love with the tradition as the research further revealed that many Brits are in the dark when it comes to the preparation method. Under half (47 per cent) of Brits know that a Christmas Pudding needs to be steamed rather than baked, and just 60 per cent could identify the correct base ingredients which make the pudding. When presented with a list of possible ingredients for inclusion in the recipe the lack of knowledge surrounding the tradition was clear as one in ten (10 per cent) believed cocoa powder should be included in the traditional pudding mix. More information about the Bake, Eat and Be Mary campaign, along with profiles and recipes from many of the Marys involved will be regularly posted throughout the Christmas period here. And look out for Lyle’s limited edition ‘Bake, Eat & Be Merry’ Lyle’s Golden Syrup® festive tin in time for Christmas. The limited edition tins feature a Christmas pudding and a traditional six pence on the front. The festive tins are supported online and in-store with recipes encouraging all the family to get involved - including gingerbread biscuits for Santa right through to little golden Christmas puddings to enjoy on Christmas day. The Christmas pack is available now in most national retailers’ as well as many local retailers across the country. The recommended retail price per 454g tin is £1.19.